There is a particularly nasty YouTube video that made the rounds several years ago where a school punk was bullying another student who was overweight. The punk kept punching the other kid who was forced to retreat until his back was against a wall. After several punches, the overweight kid picked up the bully and slammed him to the ground so violently that the punk literally bounces off the pavement. For decades, taxpayers in California have been the punching bag for tax-and-spend politicians and the special interests that consume tax dollars. Periodically, however, those receiving the blows stand up and punch back. The recall of former Governor Gray Davis in reaction to his car tax increase is a good example. For the most part, individual taxpayers and grassroots organizations are more vocal – at least publicly – against tax hikes than the business community. Certain business interests, especially large corporations, are more likely to have a “go along to get along” attitude which means that as long as a tax increase doesn’t hit their business directly (or can be passed along to consumers), they won’t put up much of a fight. The rationale for this is that many of these business interests are vulnerable to arbitrary government action that threatens their interests and it would be unwise to anger the politicians who could, with a stroke of a pen, put them out of business. But the frequency and intensity of recent tax proposals out of Sacramento and from various city halls is causing pushback from even the business community. In the City of Los Angeles, the Los Angeles Unified School District jammed through a tax increase proposal that is an affront to taxpayers of all stripes. Measure EE, appearing on the ballot in a June 4th special election, would add hundreds of dollars to property tax bills and rents by imposing a tax of 16 cents per square foot of building improvements on properties within the district. That’s $160 for every 1,000 square feet. This would hit homeowners, renters and businesses with a huge new property tax increase. Seniors are ostensibly exempt from the tax, but not from rent increases. It hasn’t been this cold since 1962, when the average high temperature for the month in downtown L.A. was 59.8 degrees, the weather service said. The state is experiencing even more storms and cold weather, as a new “atmospheric river” — a front of moisture from the Pacific — is expected to dump rain on Northern California through mid-week. According to CBS San Francisco, rainfall totals were expected to reach 6 to 12 inches in the mountains, threatening mudslides in areas affected by last year’s wildfires. Los Angeles is also expecting more rain, albeit with warmer temperatures than it is currently experiencing, before the end of the month. Last week saw a rare snowfall within the urban parts of the city, including West Hollywood. Currently, the state’s snowpack is already at 119% above its April 1 average. There are two critical issues here, neither of which appear to have been discussed in the strike negotiations. One, why do charter schools manage to educate students for so much less than traditional public schools, and two, why do they manage to do it for so much less money? As the teachers strike in Los Angeles entered its second week, it appeared the strike would soon be over. On January 22, online reports declared an agreement has been “hammered out,” with union members ratifying the deal late last night. Union representatives have consistently stated that more pay is not the only reason they’re striking. That’s believable. The unions also want to unionize charter schools, they want smaller class sizes, and they want more hiring – for example, a full-time nurse at every elementary school. All of this, however, costs money. Noriko Nakada, a LAUSD public school teacher, wrote a column in the December 18th edition of the UTLA “United Teacher” newspaper, entitled “People don’t strike for 6%; we strike for justice.” Considering each of those two phrases, one at a time, yields insights into what’s really going on in LAUSD, and by extension, throughout the unionized public schools of California. Briefly stated, according to the teachers union, “justice,” inside and outside the classroom, is to implement a Leftist political agenda with no regard to the sentiments of teachers or parents. To start with, however, Nakada’s assertion that “people don’t strike for 6 percent” is false, because getting a 6 percent raise was one of the goals of the strike, and it looks like they’re going to get that raise. So how much will that cost? If there are 30,000 teachers on strike, and their average salary is $75,000 per year, then a 6 percent raise is going to cost at least $135 million per year. At least, because whenever salaries are increased, the cost for other benefits such as pensions increase proportionately. So this concession of $135 million (or more) per year would have paid for the district to hire roughly 1,500 more teachers and support personnel, which when the details of the settlement are known, is likely to be roughly equivalent to how many new hires will be made. Where the money will come from? Who knows. The more revealing phrase in Nakada’s article title is “we strike for justice.” What are examples of this “justice”? Would it include “restorative justice,” that well intentioned, benevolent sounding practice which in reality forbids schools from expelling students of any given ethnicity at a greater rate than expulsions occur within the entire student population? Maybe “justice” is referring to “social justice,” which would include “protecting Dreamers,” “affordable healthcare,” “fair tax structures,” increasing the minimum wage, opposing the “privatization of public education,” immigrant rights, “green” space, bilingual education, reducing “inequality,” creating “racial justice” (such as through preferential scholarships for Asian, Latino, African, and LGBTQ students), and much, much more. It’s unlikely that UTLA leadership would disavow these elements of their “justice” agenda. But is it nonpartisan? Is it focused on the skills that will truly enable a graduate to be successful – English literacy, math competency, and an awareness of history and civics that instills the American values of individual responsibility and hard work? Or is it a hard Left political agenda? To answer that question, maybe the national political spending of the two largest teachers unions in America, the National Education Association (NEA) and the American Federation of Teachers (AFT) might be instructive. The table below, lifted from the book “Standing Up to Goliath,” written by the courageous Rebecca Friedrichs, reveals the political bias of these unions. 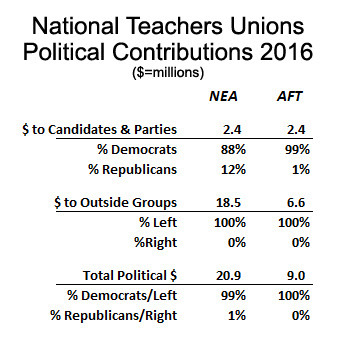 As can be seen, using 2016 data gathered by the Center for Responsive Politics, over 99 percent of direct political contributions by the NEA and AFT in that year were directed either to Left-leaning political action committees or to Democratic candidates and the Democratic party. Ninety-nine percent. Can this degree of partisanship possibly be in synch with the sentiments of teachers who belong to these unions? Not according to the NEA’s own survey data on their members. 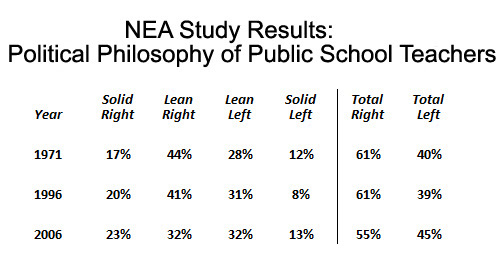 As also reported by Friedrichs in “Standing Up to Goliath,” the most recent study available on this was a 2006 survey of American public school teachers, where they were classified as either “liberal,” “lean liberal,” “conservative,” or “lean conservative.” As shown, at the time, 55 percent of public school teachers in the U.S. were either “conservative” or “lean conservative.” Has this changed over the intervening decade? Would the findings be different in California compared to the rest of the nation? Of course the answer to both questions is yes, but how much different? Two things can be reasonably inferred from these charts. (1) The political ideology of public school teachers in America is split roughly evenly between liberals and conservatives, and (2) the national political spending of the major teachers unions is almost 100 percent allocated to liberal causes and Democratic candidates. From their literature and their rhetoric, it is almost certainly accurate to state that the political agenda and political spending of the United Teachers of Los Angeles is in lockstep with that of these national teachers unions. And it is extremely unlikely that literally 100 percent of the UTLA teachers – and, more importantly, the parents of LAUSD students – adhere to an ideology that is 100 percent supportive of liberal causes and Democratic candidates. The question of whether or not unions should even exist in the public sector is one worth asking. Already, the recent U.S. Supreme Court decision in the Janus vs. AFSCME case has recognized that all public sector union activity is inherently political. If so, shall the California affiliate of the NEA, the California Teachers Association, continue to collect and spend an estimated $325 million per year? Shall the California affiliate of the AFT, the California Federation of Teachers, continue to collect and spend an estimated $100 million per year? Shall the UTLA continue to use their formidable power to deny school choice in spite of forcing students to attend mediocre and failing schools, to unionize charter schools despite many of them achieving spectacular results, to reject the common sense, bipartisan reforms proposed in the Vergaracase, and to inculcate students with Leftist political ideology, at the same time as their financial demands leave the district teetering on the brink of insolvency? By all recent indications, yes. For years, Southern California lawmakers have tried to steer clear of decisions that make driving more expensive or miserable, afraid of angering one of their largest groups of constituents. But now, transportation officials say, congestion has grown so bad in Los Angeles County that politicians have no choice but to contemplate charging motorists more to drive — a strategy that has stirred controversy but helped cities in other parts of the world tame their own traffic. The Metropolitan Transportation Authority is pushing to study how what’s commonly referred to as congestion pricing could work in L.A., including converting carpool lanes to toll lanes, taxing drivers based on the number of miles they travel, or charging a fee to enter certain neighborhoods and business districts. Without any new proposals from Los Angeles Unified School District officials coming over the weekend, the union representing 34,000 district educators is moving forward with a strike set for Monday morning, Jan. 14. Calling the offer on Friday by district officials unacceptable, Alex Caputo-Pearl, United Teachers Los Angeles president, said the union was engaged in a “battle for the soul of education” at a news conference Sunday afternoon at union headquarters near downtown Los Angeles. “We are more convinced than ever that the district won’t move without a strike,” Caputo-Pearl said as he was flanked by roughly two dozen teachers, parents and students. “Let’s be clear, teachers do not want a strike. Teachers strike when they have no other recourse,” he said. After a temporary delay, teachers in the Los Angeles Unified School District seem likely to go on strike Monday morning. They are demanding, among other things, a 6.5 percent pay increase after rejecting a 3 percent hike offered by the district. About 30,000 teachers in the nation’s largest school district had originally planned to strike on January 10, but union leaders postponed the strike until Monday after a judge ruled that the union had failed to give the district adequate notice for the work stoppage. Even with a few extra days to reach an agreement, the two sides remain apart, according to the Los Angeles Times, despite the district offering to pay an additional $75 million to meet union demands regarding staffing levels and class sizes. Even without handing out pay raises, the Los Angeles Unified School District finds itself in dire financial straits. A major driver of the budget problems at the LAUSD is employee pension and health care costs. According to the budget task force, those costs will consume more than half of the district’s annual budget by the end of the next decade. Since there is no way to give employees raises without also increasing the future liabilities owed by the pension system, boosting pay now will only add to the long-term problems facing the district. “LAUSD has already offered much more than it can afford (increase teacher pay across the board, dollars for lower class sizes, and new positions) so either way the resolution will likely expedite the drawdown of the district’s reserves,” says Aaron Smith, an education policy analyst for the Reason Foundation, which publishes this blog. The other major issue is class sizes. The union is demanding that the district hire more teachers and staff to reduce the average class size in Los Angeles schools—which currently range from an average of about 26 students per class in elementary schools to nearly 40 per class in the city’s high schools. In its most recent offer, the school district said it would set caps of 37 students for high school classes and 34 students for lower grades. But while smaller class sizes would be nice, that’s far from the only consideration facing the LAUSD. As even former Obama-era Education Secretary Arne Duncan has argued, teacher quality matters far more than class size as a determinant of student outcomes. Hiring more employees is unlikely to solve the district’s problems. Since 2004, the LAUSD has seen a 16 percent jump in administrative staffers while student enrollment has fallen by 10 percent. Increasingly, students (and their parents) are opting for charter schools, which have proven to be successful and efficient alternatives. More than 160,000 students already attend charter schools in Los Angeles, and another 41,000 are on waiting lists trying to get in. The school district likes to blame its structural problems on the loss of students to charter schools—but the real problem is that LAUSD has failed to adapt to changing circumstances. In 2015, the district’s Independent Financial Review Panel made a series of recommendations to help the district adjust to competition from charters—for example, if employees and retirees had to cover just 10 percent of their health insurance premiums, the district could save $54 million annually. Those ideas have mostly been ignored. A long strike will likely only exacerbate those problems, warns Smith. A protracted strike may encourage more families to seek out alternatives to the public schools.